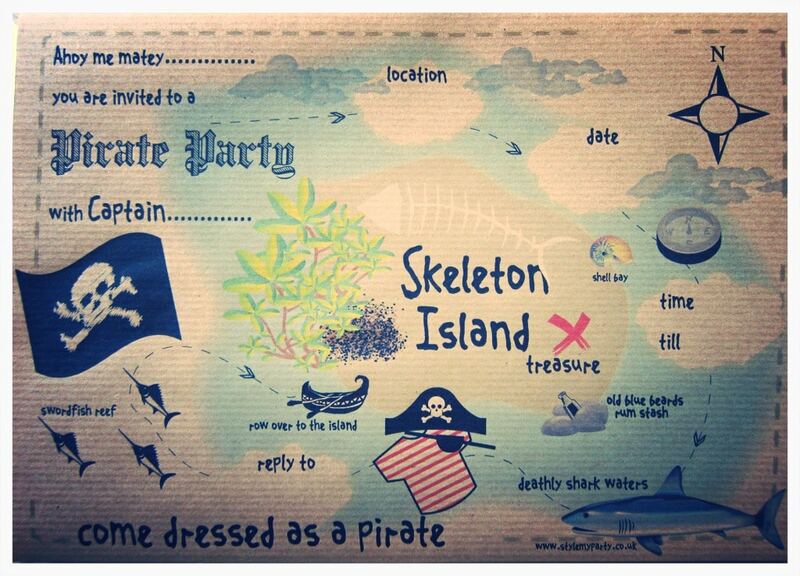 How to host a DIY pirate party for toddlers! 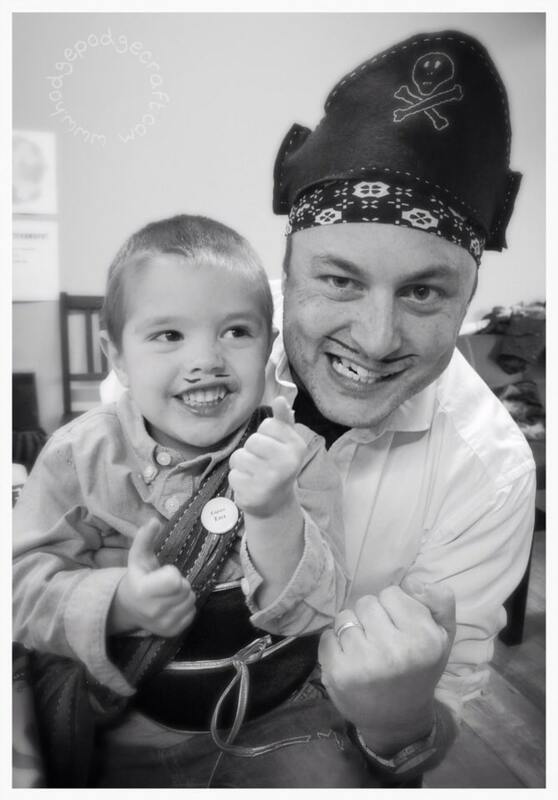 How to host a DIY pirate party for toddlers! 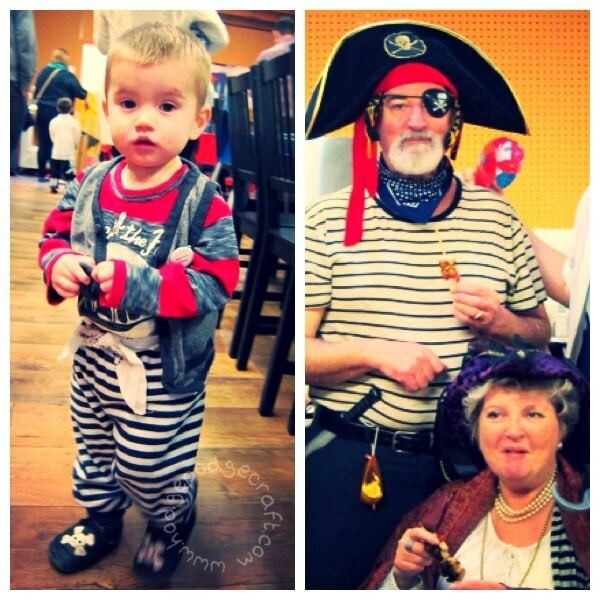 I had so much fun organising Pickle’s DIY pirate party for his 3rd birthday. I’ve already shared most of the tutorials here, but I wanted to pull it all together in a round up post including everything you could possibly need to host a DIY pirate party for toddlers. 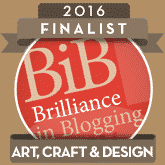 Just click on the links for the full tutorials..! 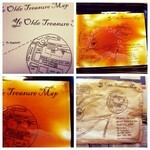 We aged our invitations in the oven with tea and included a hand-drawn map, but you could save yourself some time and use Style My Party’s free printable pirate party invitations (picture below). 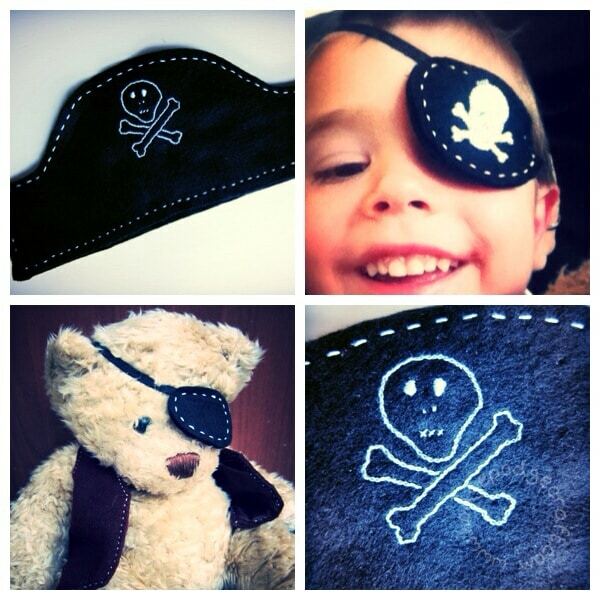 I made Pickle’s hat using this simple tutorial by Simple Simon & Co. and a matching eye-patch from black felt, elastic and a skull and bones clothes plaster. Of course we had to make a mini one for Nonno Bear too! I didn’t buy anything new for the boys’ outfits. We picked up a couple of foam cutlasses at Oxfam for about 60p and the rest was cobbled together. That’s what I love about a pirate outfit – anything striped, red, white, black or blue will do. Layer it up with a scarf, sash or bandana, maybe a waistcoat and you’re done. Chops wore his slippers as they happen to be jolly roger ones! Grumps really pushed the boat out with his costume – dreadlocks, parrot, dagger and a bag of gold chocolate coins for the kids – such attention to detail! We used lots of flags and bunting to make the (soft play) party venue look more ‘piratey’. 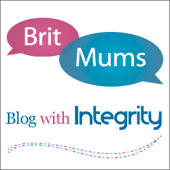 The flag in the picture below is made from a pillowcase and you can find the full (easy!) tutorial and free printable template at Style My Party (you can also find pirate bunting there). 1. 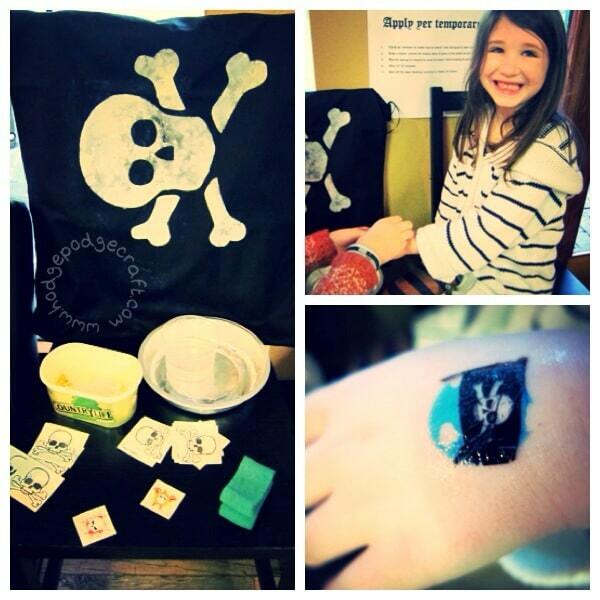 Fake tattoos were provided for all the little pirates on arrival. We set up an area with application instructions, sponges and water (see above). 2. 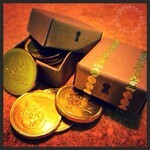 A treasure hunt – we made giant salt dough doubloons and hid them around the party venue for the kids to find. 3. 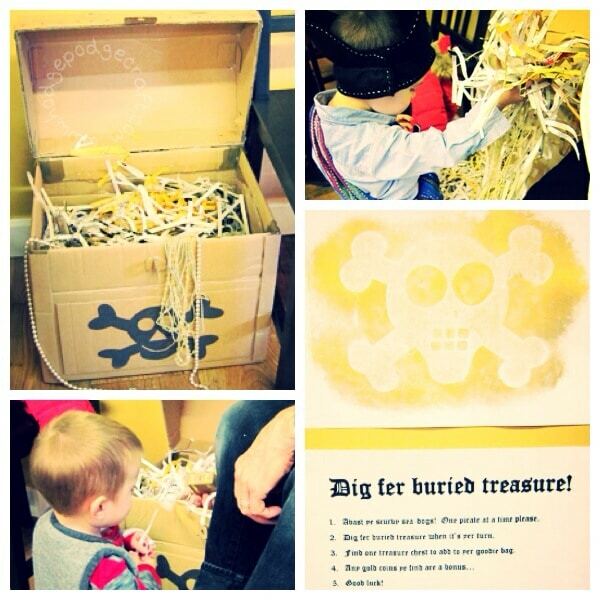 Digging for buried treasure – we made a treasure chest out of a large cardboard box and filled it with shredded paper. We then hid mini treasure chest boxes filled with gold coins inside for the children to dig out and add to their goodie bags. 4. 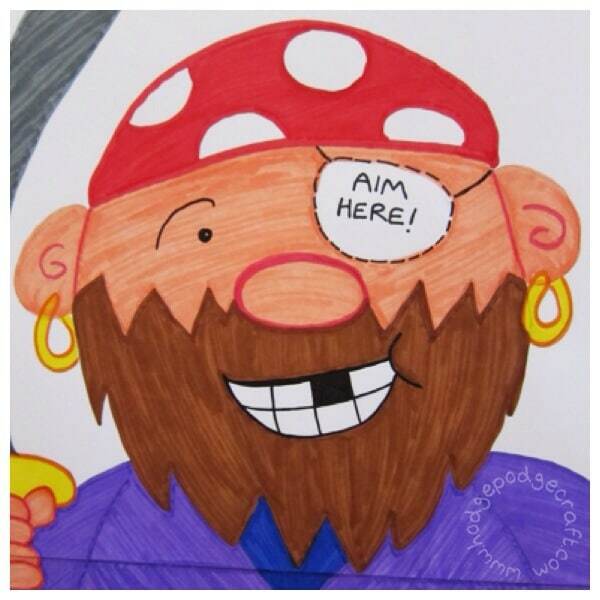 Pin the eye-patch on the pirate – a variation of the classic party game (free printable here). 5. 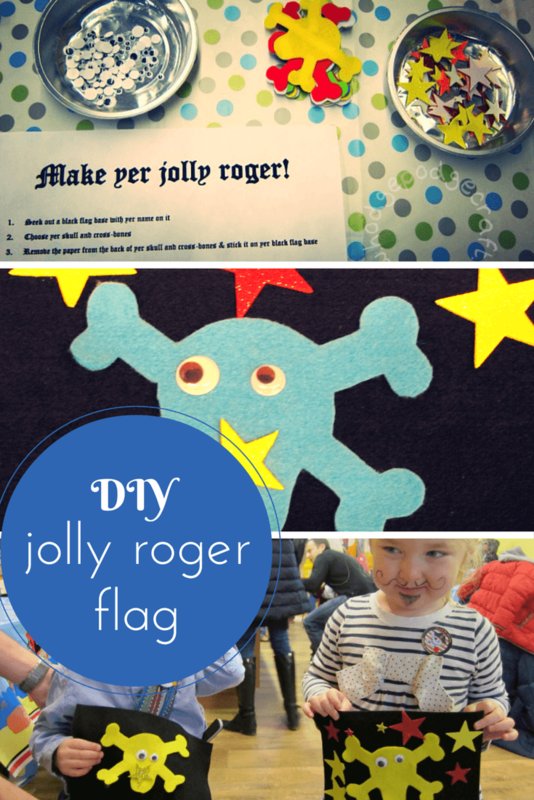 Make your own jolly roger mini flag – this is a no mess craft activity and the kids can take their flags home with them as a keepsake. I made Pickle an easy peasy pirate ship cake (full recipe and tutorial here), which he LOVED. 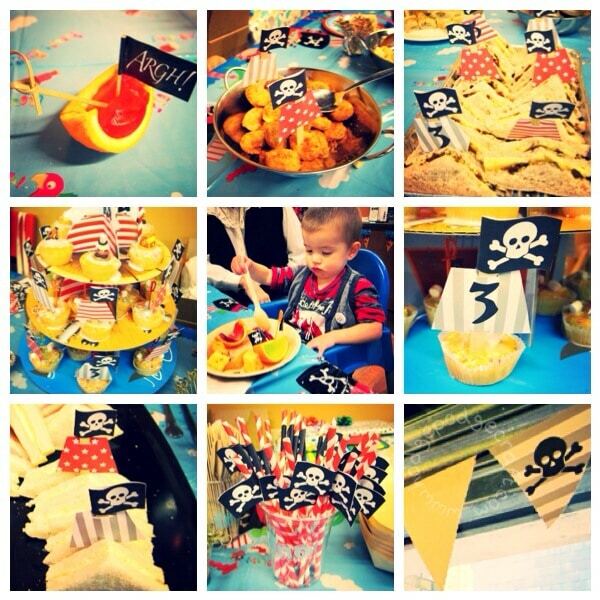 We used skewers, flags, straws palm leaf plates, bowls and wooden cutlery from Style My Party to make the party food (jelly boats, ‘porthole’ hula hoops, rainbow fruit swords & ‘golden nuggets’ of chicken) a real pirate feast! 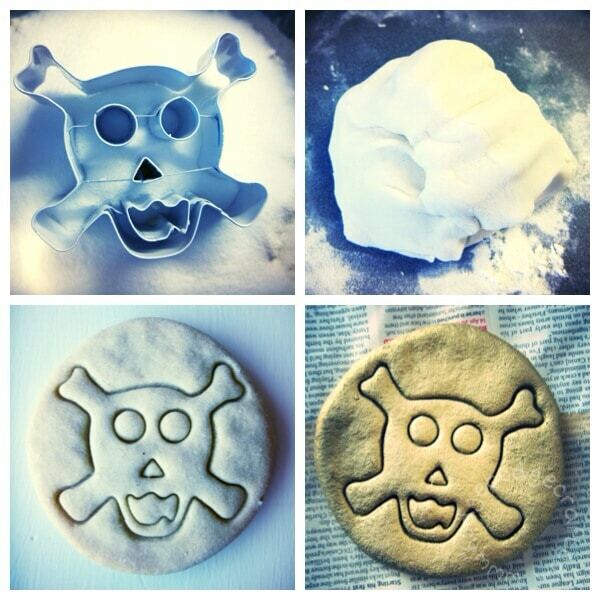 We handed these out at the beginning of the party so that each guest could put their mini treasure box, DIY jolly roger flag and giant salt dough doubloon inside as they made/found them. I also included a badge with each child’s pirate name, a pirate pencil and a booty bag containing a chocolate fish and another temporary tattoo. 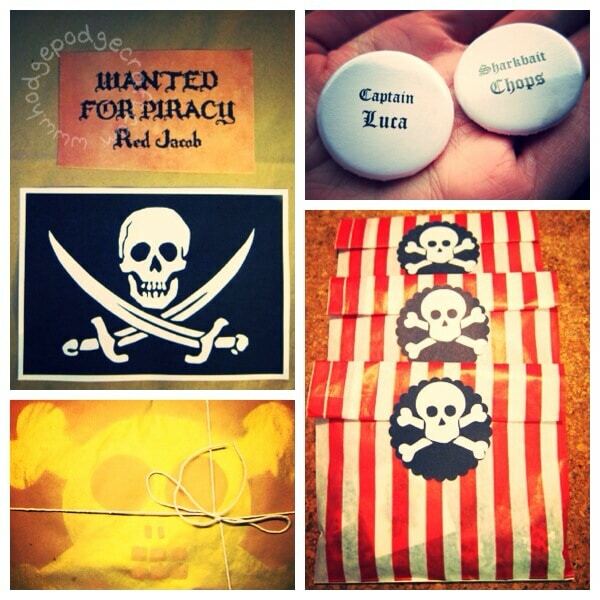 The goodie bags were made from large paper grocery bags and each had a pirate ‘WANTED’ label with their pirate name on, plus a large skull and crossbones. We had prizes for the 1st and 2nd place boys and girls’ costumes (books for 1st place, wrapped in brown paper, spray-painted with a jolly roger template – free stencil here and tied with string, pirate stickers for 2nd place), plus a bottle of rum for the best adult costume – which went to Grumps of course! 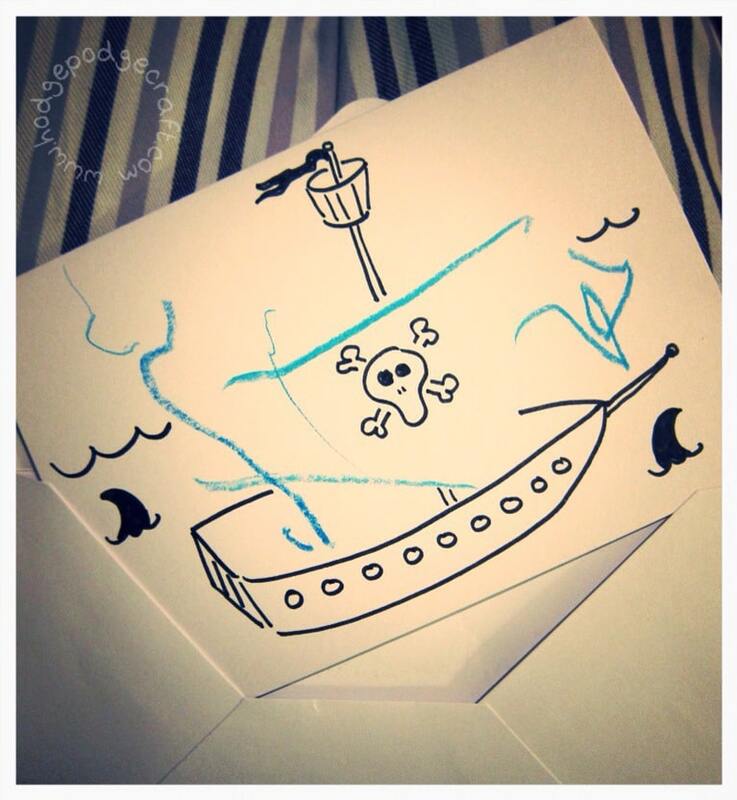 Pickle drew his own thank you cards using his brand new pencils, but I did feel compelled to add to this one, as his drawing really reminded me of a large sail in a choppy sea (maybe I just have an over-active imagination)! I had to include this photo of Pickle and Mister Podge with their matching pirate moustaches and best “Arrrgh!” faces – it makes me smile every time I see it! This is totally awesome. 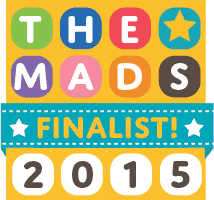 Will you co-ordinate my children’s parties from now on? I think though (like yours), he is very easy-going, so as long as he is with other kids and there’s music to dance to and plenty of sausage rolls, he’s happy..! 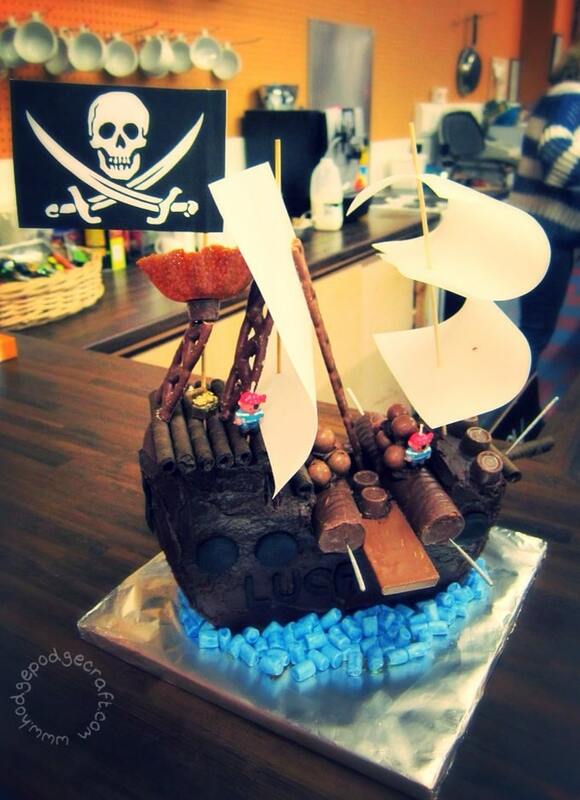 June 2, 2014 @ 10:36 pm Hodge Podge CraftHow to make a fantastic, easy peasy chocolate pirate ship cake! 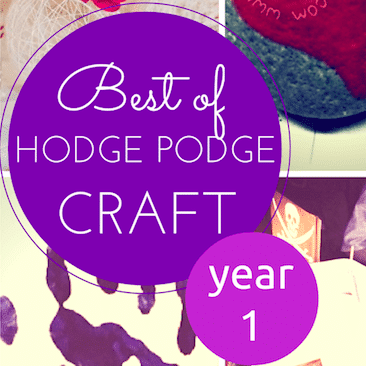 March 10, 2015 @ 10:26 am Hodge Podge / How to make giant salt dough doubloons and a no-mess DIY jolly roger mini flag activity for a pirate party!